We can't wait for it to blow! Grease a ramekin with the butter liberally, on both the outside and the inside, and put it on a baking tray. Lay the pizza dough over the top and shape it around the ramekin. Add a circle of Schoko-Bons around the edge of the pizza dough, and fold the pizza dough over them and seal the dough with your fingers. Brush the dough with a beaten egg and then bake in the oven at 200°C for 10 minutes. Let the dough cool before removing the ramekin. Chop the Kinder Bueno and hazelnuts into small pieces, and melt the dark and white chocolate. 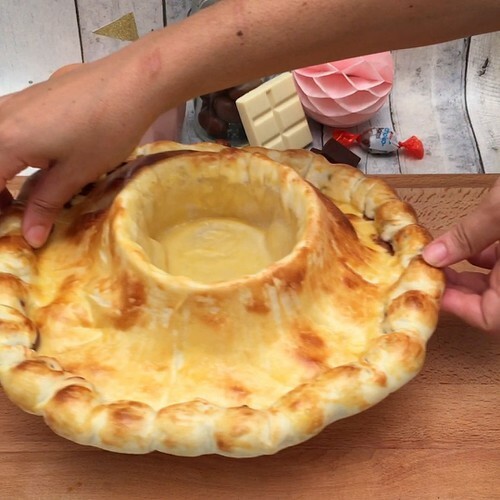 Pour the Nutella over the volcano, then add the chopped Kinder Bueno and hazelnuts on top. Add the melted chocolates into the middle and swirl together with a toothpick. Enjoy.